Our look at the 'Not Quite Right - The Crazies in the Blue Paint' premier. - Very Barrie Colts | A website covering the Barrie Colts of the OHL. 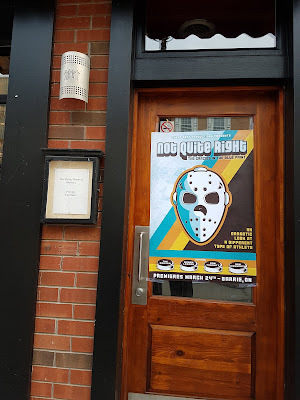 Home Barrie blog Cheap Seats Productions John Vanbiesbrouck movie NHL Not Quite Right OHL premier Our look at the 'Not Quite Right - The Crazies in the Blue Paint' premier. Our look at the 'Not Quite Right - The Crazies in the Blue Paint' premier. 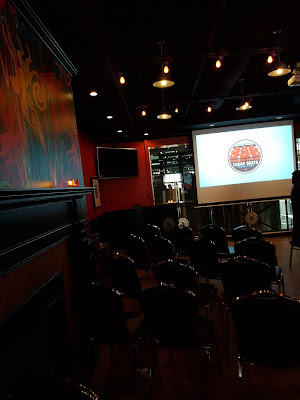 Earlier this year we were contacted by Jeff Bothwright, one of the owners at 'Cheap Seats Productions' here in Barrie, Ontario about a goalie movie they were working on. First, this is not a documentary, nor is it a film.. I was corrected on that kindly at the premier by Jeff telling me that it is a 'docufilm'. "We make docufilms." On, March, 25th we were invited to the premier for 'Not Quite Right - The Crazies in the Blue Paint'. Jeff gave us this synopsis. It's a look at the guys in the blue paint. From the gear differences years ago, why the heck guys want to jump in there, what players think of the goalies and how the paint jobs area reflection of the goalie and artists collaboration. We are also exploring the role of the backup, the mentality needed, how they train now and a host of other topics. 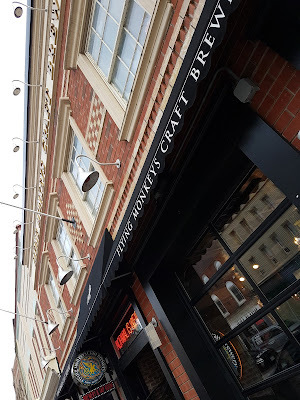 The premier was held at 'The Flying Monkey Brewery" here in Barrie. This synopsis is a perfect breakdown of the docufilm. It featured many great names from Manny Legace to John Vanbiesbrouck. Also included were former NHL official Ron Hogarth, mask painter David Arrigo and even Jeff Bothwright himself who also was a goaltender. This just scratches the surface of all who were included. So many great sit down interviews throughout the docufilm, I feel the best sell on the entire film was how well it flowed. It was very clean, well cut with very smooth graphic transitions throughout. The presentation was excellent and they found a way to provide interesting looks at all things about goaltenders without ever coming across long winded. The best way to describe the docufilm would be that the team presented several great questions, and had all sorts of people answer them who have been around the sport. You know, people best fitted to take on such questions. From how the position has grown, training, equipment and even goalie mask paint, I don't think there was a topic that was overlooked. Jeff got a chance to interview former Florida Panthers goalie, John Vanbiesbrouck who he told me before the premier was his personal favourite growing up and John presented a very interesting perspective on the position, including the story on how the fans throwing rats on the ice during panthers games started. I was able to take a moment to ask Jeff a few questions about the film. How long did it take to put ‘Not Quite Right’ together? We started in November last year, was a quick setup and filming for sure! What was the most memorable part of filming? Meeting the guys you watched growing up and finding out they are absolute gems. Everyone we worked with was amazing. They say don't meet your idols but we did and they were awesome. Did any of the interviews stand out to you during the filming process? Mark Laforest is an absolute beauty. Was a great guy to just chat with about the game. Ron Hogarth was fun too, so many good stories about the old time guys. Part of the film discussed mask paint. Do you have a favourite goalie mask paint job? Probably Beezers Panther mask. Ron Tugnutts beer splash mask is killer too. Would you consider doing another “docufilm”? Already in the works (laughs). Now that the premier has come and gone what is next for ‘Not Quite Right’, and when/how will people be able to view it? A little bit of polish and then getting it to film festivals in the area and beyond! Also more small screenings in Ontario, stay tuned for dates! After festival season, we will hopefully be putting it online! Details to come! We don't want to give away anything but we would say that this was a well done docufilm. It wasn't drawn out, it was put together nicely and flowed well with great information, while keeping a steady flow of laughs. Goalies might be crazy, but all involved seemed to be genuine people. It came across that all involved really enjoyed being included in the film and that really translated throughout. We are very pleased to have been included. We will continue to stay in contact with our friends over at cheap seats and will provide updates when and how you will be able to see 'Not quite right'. To keep up with all things from Cheap Seats Productions, be sure to check them out on Facebook here. Thank you to our friends at Cheap Seats, and Jeff for having us out for a great and entertaining night. If you get the chance to watch this docufilm and are a fan of the sport, I strongly recommend it!